Have you discovered the home- and life-management systems that help your world run smoothly? You know the systems that I’m talking about—the ones that work so well for you that you never have to make yourself do them, because you actually want to! I’ve found that through trial and error and by taking detailed mental notes on what really works for our family, I’ve slowly arrived at systems that make life simpler and leave more room for the things that matter most. And, as I’m sure is the same for you, technology is often the cornerstone of my most simple but effective systems. 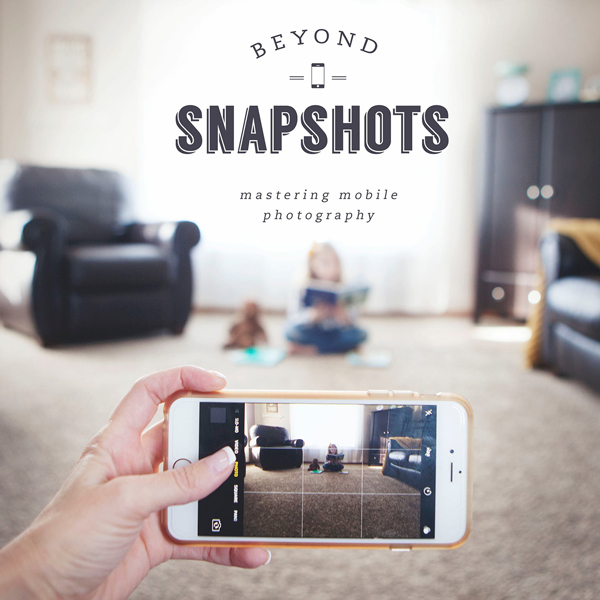 As a mom, home manager, blogger and photographer, I couldn’t stay on top of everything without the technology features that I’ve come to rely on. Because I always enjoy hearing about technology hacks that my friends are using, I thought I’d share five of my most relied-on features with the hope that you’ll get a new idea or two. Enjoy! Keep an online family calendar. I’m continually adding events and tasks to our family calendar using Google Calendar. What I appreciate most about it is that it syncs to my phone as well as my husband’s, which means we’re both aware of the family schedule at all times. Plan weekly menus using Pinterest. Every Sunday night, I take some time to review my calendar for the week and plan a simple menu. I’m not perfect at it, but when I do get 3-4 meals and our grocery list planned out, it helps SO much! Pinterest is an incredible tool for menu planning. When I want to try something new, all I have to do is scan my dinner board for new ideas, and I always choose a couple of tried-and-true family favorites from the Simple As That Recipes board. Utilize tethered shooting. This tip is key for anyone who regularly works with photos. While I’m relatively new to tethering, it has already made a huge difference in my photography work flow. 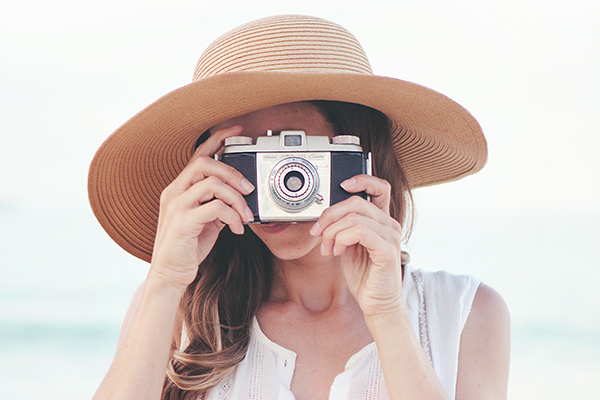 With my camera connected to my laptop while I shoot, I can see my photos in real time, make adjustments to my setup, re-shoot and delete as needed. I’ve noticed I’m able to work much more quickly and efficiently. Move photos between devices. While we’re talking about tools for photographers, Air Drop is such a handy feature for professional photographers and moms alike. I often need to move images from my iPhone to my laptop, so I can use them for blog posts or add them to a photo book. Apple’s Air Drop feature saves me the extra steps of emailing them to myself or using jump drives to transfer files. Use time more efficiently. 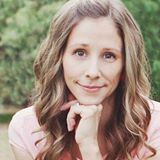 As a mom, my day is often divided into 10-15 minute increments, between snack time, driving kids to practice or preparing meals. I use the timer on my phone to help me use these small windows of time wisely. I find that if I set a timer for a few minutes—to finish up a load of laundry, do a quick tidy in the kitchen or return a handful of emails—I’m much more efficient. And the fact that I can start and finish one task in a given period feels great. These few-minute tasks may seem small, but they add up at the end of the day! 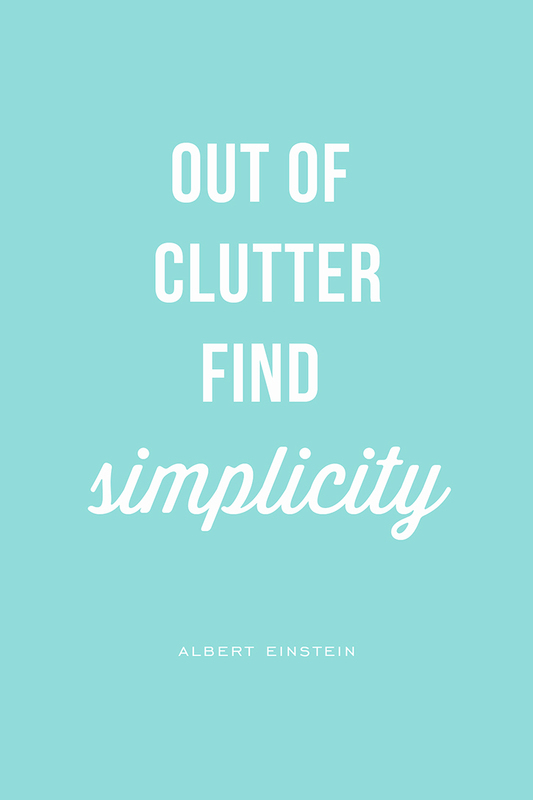 I love Albert Einstein’s words, “Out of clutter find simplicity.” It’s exactly what I’m going for, and I bet you are too. 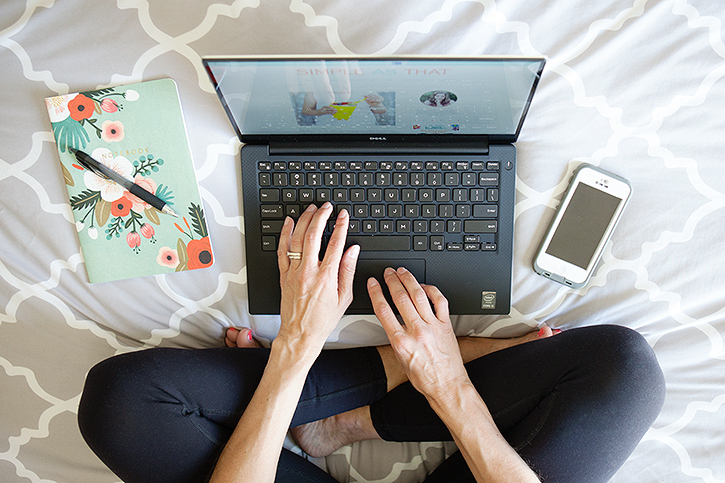 Because we’re on the topic of technology, I thought I’d share a few tips to help you keep your devices working for you, in more ways than one! 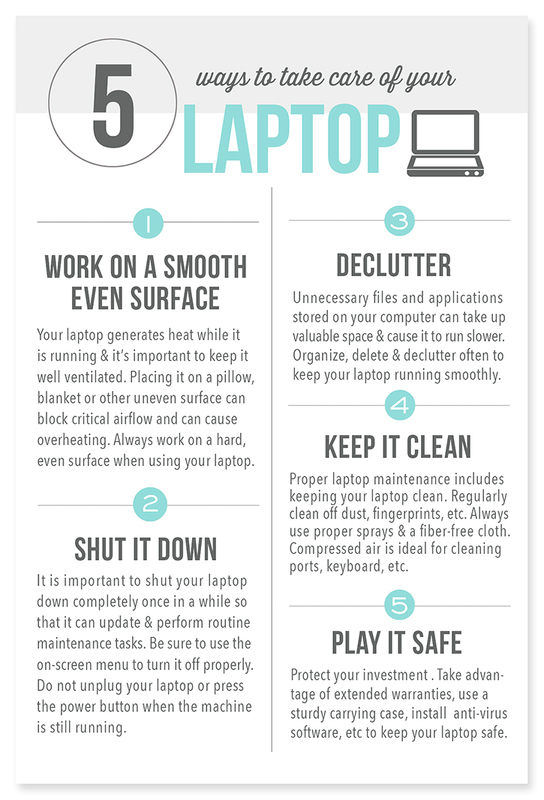 Below you’ll find 5 things you should keep in mind when maintaining your laptop. But of course, this list also applies to tablets and desktops! This list is available as a printable PDF. Download, print it out and pin it to your bulletin board or hang it near your desk where you’ll see it and be reminded to check (and recheck) these points to help keep your machine in tip-top shape! 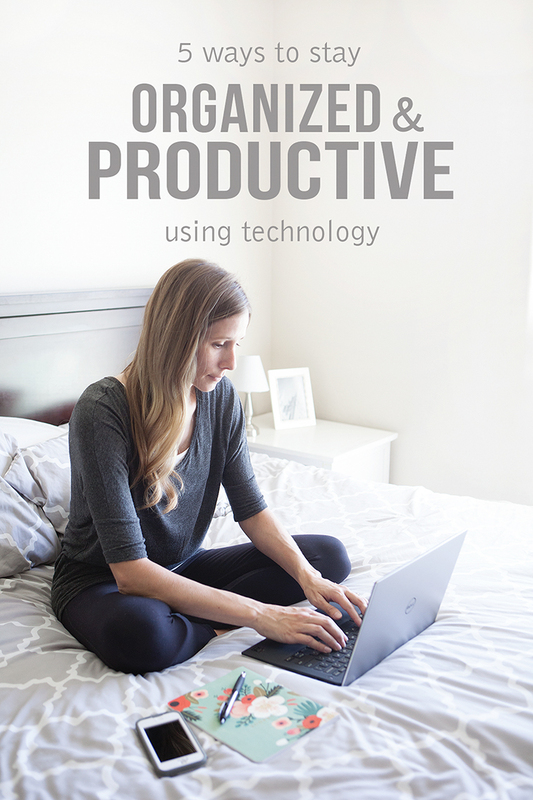 So let’s hear YOUR technology hacks—How do you use technology to stay organized and productive on a daily basis? Hi! I have a silly question for you. Where did you get the notebook shown in the picture of you sitting on the bed? So cute! Hello Natalia – I use an Epson Artisan 730. Rebecca, this all sounds so efficihen and nicely orcestrated! Bravo! As a list lover myself, I totally get what you’re saying. You might want to check out Keepy, it can help you further in de-cluttering your space by saving, organizing and sharing your kids’ creativity within the family, keepying everyone in the loop. It’s easy to use, friendly to all ages and many parents, homeschool teachers and grandparents have declared it a must. O and did I mentione you can Keepy for free? I love the idea of setting your timer to make better use of small blocks of time. I need to try this. I feel like I am constantly wasting those small blocks of time scrolling through meaningless mumbo jumbo on social media, which definitely has an impact on my productivity at the end of the day. Plus, I love the idea of working smarter not harder. I may have to adopt that one myself. Technology is great, but man alive…it can sure be a source of distraction if I am not on top of it! 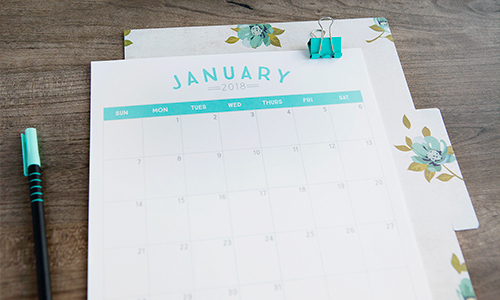 Do you ever worry that someone else could gain access to your calendar on google, and then know when your house would be empty and accessible? I’ve been hesitant to use internet based calendars, and just wondered if my fears were hindering me more than any risk.